Authored by: Julie Kerr Casper, Ph.D. This eBook explores one of the most important uses of the land: the production of agriculture. 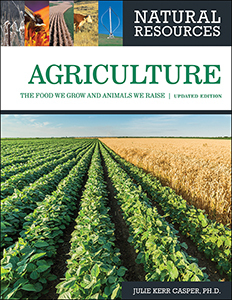 Readers will learn that farms and ranches produce much more than food; but scientists, farmers, ranchers, and other landowners haven't solved conservation problems—yet. How agriculture can be used to create fuel in today's energy-hungry world. Julie Kerr Casper, Ph.D., has been an Earth scientist for the Bureau of Land Management for nearly 30 years. She is the author of several award-winning novels, articles, and stories.